Okay, who wants to go to Parkersburg? There are two hotels on the market here . . . This bubble score is dismal for a Red Roof Inn, although we've seen worse. This is a pretty much off-the-shelf Red Roof Inn exterior corridor prototype built in 1975 that's showing its age a bit, but lots of similar ones are out there that work very well. It's in two, parrallel two-story buildings. 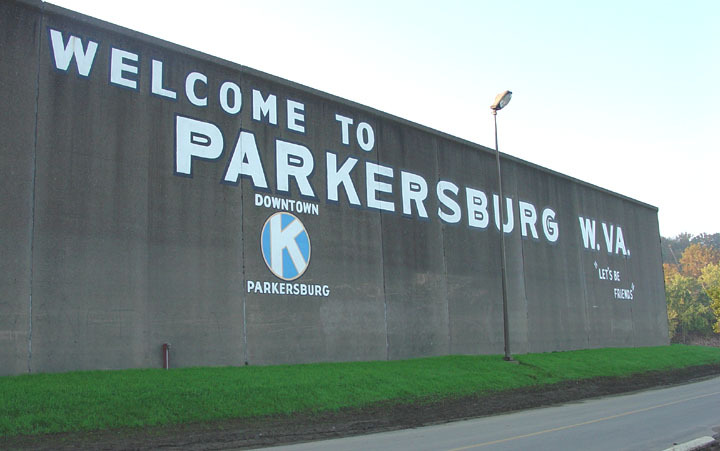 Parkersburg has two easily identifiable submarkets, not an unusual layout for a small city of its size. You have the hotels out on the I-77 corridor as one submarket, you have the hotels in the city itself as the other. This property in the I-77 corridor, within sight of the highway. These properties out on the interstate are going to be a little more I-77 dependent but the Parkersburg area is not that isolated, and Wood County has more outlying demand generators. 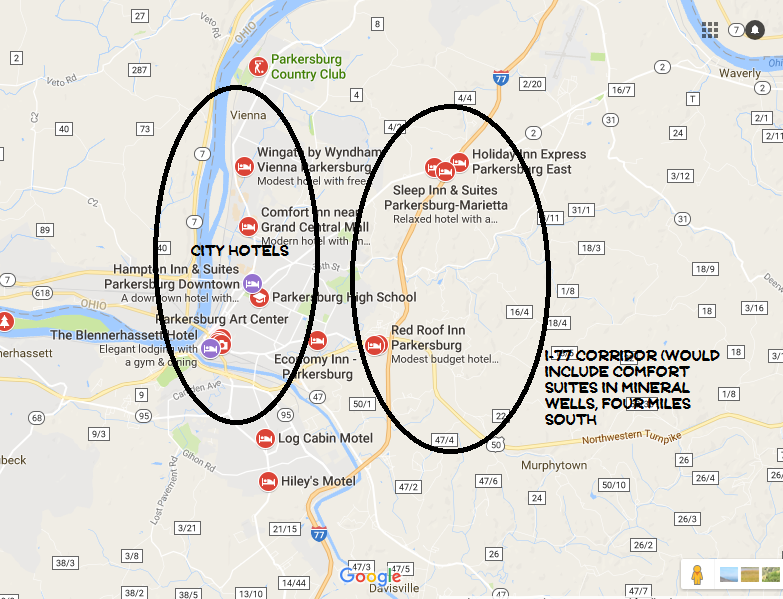 I'd certainly pay WVU-Parkersburg a visit and look for secondary demand generators -- it's on the side of I-77 away from town, and this property is the closest hotel to it. This property has the added advantage of easily being positioned as "the cheapest decent hotel in town". To achieve that, we're going to have to renovate the guestrooms, but it's obvious from this property's TripAdvisor hits that this is going to need doing anyway. Parkersburg is the third largest city in West Virginia. The area economy is driven by education and finance. The Bureau of the Fiscal Service, United States Department of the Treasury, is located here; and Highmark Blue Cross has significant operations. Ohio Valley University's campus is on the city's northern border, and the campus of West Virginia University is located on the other side of I-77. Camden Clark Medical Center is a regional hospital located downtown, three miles from the property. It has recently completed an expansion. This is an I-77 offramp property. 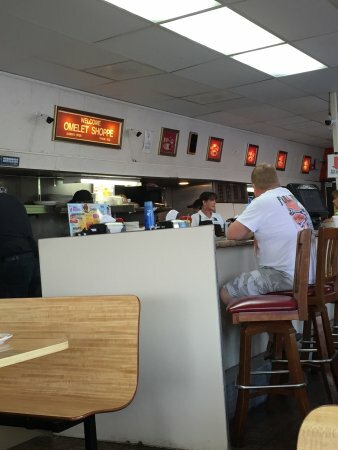 There is an Omelet Shoppe adjacent, another diner about a quarter mile away between the hotel and the onramp, and a Long John Silver's on the right, in between, that's past its sell-by date and closed down. Unfortunately, there's not much else on this exit. If you want to keep the Red Roof franchise, the facility itself should need very little other than a good cleaning, It has the more recent room decor (and any that do not, need to get the more recent Red Roof room decor forthwith -- some of the room photos we see online make us wonder), but we might look at carpet and mattress replacement, and also be prepared to replace some wallcover in some rooms. In any event, every square foot of carpet that isn't replaced is going to be steam-cleaned, and every sheet, towel, pillowcover and blanket in the place is going to be tossed out and replaced with something new. And we're going to go over their laundry equipment very carefully -- no more hits on TripAdvisor about dirty sheets or towels, or dirty carpet, or dirty anything else. If you change flags, we're going to have to knock out two rooms near the office to accommodate a food service operation for the complimentary breakfast that any other brand will require. We always recommend installing a convection oven and offering the breakfast items fresh-baked. We’ve got the parking lot space, we’ve got the rooms, let’s see if we can find ways to rent 55 of them at a pop. I’d like to put a lav dump in a more isolated corner of the parking lot, so we can aggressively pursue bus tour business. We don't want to use that as a commercial RV dump: heavy use will generate a mess and odor problem. But motorcoach tour operators that I've dealt with in the past are particularly appreciative of an amenity such as this. They don't pursue discounts very aggressively -- they just pass the costs of the rooms to the tour customers, anyway -- but they like being able to have the coach serviced; and with Trailways no longer in business in most parts of the country, there aren't that many places to get it done any more. We have a maintenance guy there when a coach is scheduled to arrive to help unload the coach, we have the driver park the coach over the lav dump, we dump the lav and hose down the area around the dump spot; we swab out the lav, refill it and dump in some de-germ, we sweep and mop the coach and get the interior looking nice and fresh, and we wash the coach. Total time, one guy, a little over an hour, maybe two hours if you want to give it a really good job. (And we do. As you can guess, I worked for Trailways years ago, when there was a Trailways; and you could keep it down to not much more than a half hour if the coach wasn’t too filthy dirty when it came in, and you hustled. Of course, we didn’t have to unload.). Small price to pay for being able to rent an extra 25-50 rooms in a night, even if we have to give a free room to the driver. This property doesn't really need 105 rooms. I'd consider taking a few of them out, and putting in more specialized suites, including family and children's suites (two to three room bays each, maybe four or five of them), business suites (two room bays each, perhaps three of them), and fitness suites (two room bays each, perhaps two of those). Exterior corridor properties in urban locations should always be fenced and the only way in or out should be through a decorative gate monitored 24-7 by a video camera. This isn't an urban location, but I'd do it anyway. It's not high on my list of things that need doing, but I'd want it done in a few years as it can be paid for out of revenue. Both facility design and management, as Beechmont would approach it in this location, will reflect the need to maintain this property as a good quality economy property. The in-room safes have got to go. Few people ask for those in hotels that don't have them, everyone complains about the cheesy little $1.50 charge added to their bill in hotels that do, and this hotel takes way too many TripAdvisor hits about them. I would outfit maybe ten rooms with safes that we acquire, and get the vendor who owns those safes currently in the hotel to come and get them. Security needs to be tightened up: there are too many complaints about people loitering in the parking lot, and one TripAdvisor reviewer even told of a tailgate party. It doesn't work at any hotel, especially one with exterior corridors. I might find one or two room attendants there who might be worth salvaging after a word of prayer about housekeeping-related hits on TripAdvisor and how we're not going to have that anymore, but I'd plan on restaffing the entire housekeeping department just in case. We need to have marketing at this property be a bit more intentional. Certain things are going to occur in marketing any hotel, but we want to focus on what will work in Parkersburg. This property is in an easy to find, but not so easy to get to, and hard to see from the highway, location. You're going to need some marketing skill to do well with this property. For a client-investor who acquires both this property and the Comfort Inn in Parkersburg which is also on the market, I would commit to hiring a full-time business development representative to market both properties. I know the market in Parkersburg took a wallop and went a little crazy with the competitive pressure from the construction of the new Sleep Inn, and the new Holiday Inn Express, but you have to get yourself back on your feet and we have to recover from that sometime . . . If the Red Roof Inn brand is working for this property (I want to see reservation contribution as a percentage of total guests that exceed franchise-related costs as a percentage of total revenue, and Expedia and Travelocity and other online travel agencies don't count in the math I use to calculate it), then keep it. Red Roof isn't high on my list of favorite franchises because so many of their conversion properties look bad, but this property was built to be a Red Roof Inn and if it's managed correctly, it should be indistinguishable from a good company-owned Red Roof Inn. I seek those out when I'm on the road. For an economy property, though, Red Roof is about the best brand you can get -- or was, until they started franchising and allowing conversions on the cheap. 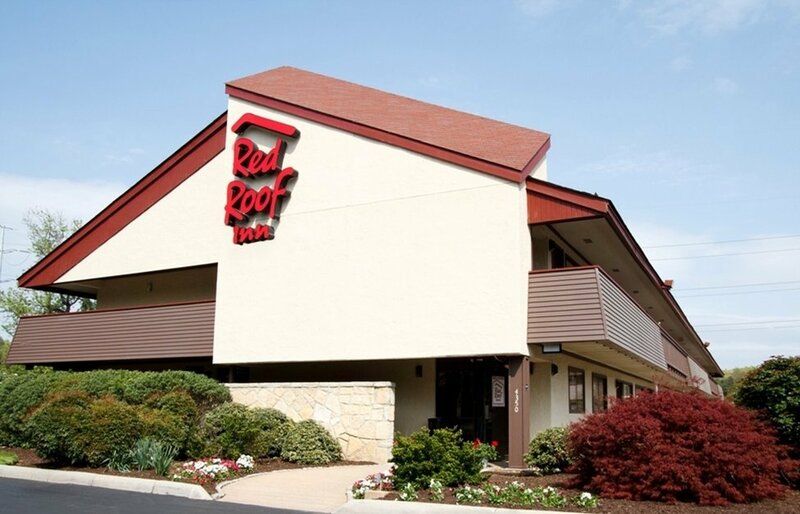 (Before they started franchising, it was very rare to see a Red Roof with a less-than-4.0 TripAdvisor bubble score.) Make sure the five-year termination options are in place. Red Roof isn't going to hand success to you on a plate. If you want success that comes in a 'kit' you can buy, sign up as an Amway distributor. It's only going to happen for you at this location in Parkersburg if you have strong local marketing -- but we anticipate and assume that with any hotel franchise, even first-tier franchises like Marriott, Hilton and IHG. No asking price shows up on the listing page but I see nothing here that's worth more than three times gross room revenue, a very mediocre location, and quite a few problems to work out. This is a three-million-dollar hotel, no more, if no more problems turn up on a site inspection, but if I were making an offer, I'd put $2.5mil on the table and see what they do. Food and beverage should be limited to the required complimentary coffee and tea required by the Red Roof flag (we'll revisit continental breakfast if we change flags). Someone who had some skill and experience doing corporate and group marketing, but not a large, policy-bound corporate owner. You'll want a sharp, aggressive, think-outside-the-box salesperson, even if it's someone that only works part time. 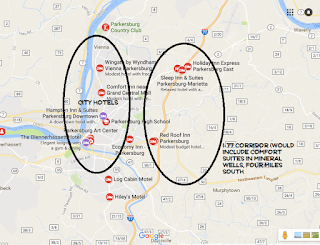 If you currently own or operate a hotel in Nashville, Montgomery, Ala.; Searcy, Ark., Abilene or Lubbock, Texas; Wilkes-Barre-Scranton, Camp Hill, or Harrisburg, Pa.; Covington, Ky. or the Minneapolis or Phoenix area; you should consider a Parkersburg property, especially if one of more of your current properties is getting corporate or group business from one of the companies previously mentioned. Without the marketing skill and the ability to reach out to corporate and group customers, this property is going to turn in a lackluster performance. You'll rely way too much on locals, and you'll have security problems.